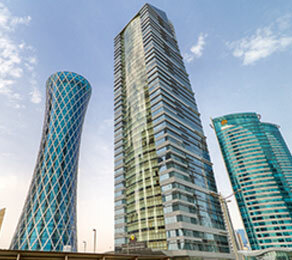 AKH Tower is an impressive structure in the West Bay business district of Doha in Qatar. CCL was commissioned by the main contractor, Ramco Trading & Contracting Co., to design, manufacture and install 41,000 m2 of post-tensioned slabs. AKH Tower was originally designed as reinforced concrete beam, hollowcore slab structure, but an alternative solution was needed because of time constraints and issues with the mechanical and electrical fit-out of the tower. CCL offered an alternative post-tensioned solution, which not only brought benefits in terms of architectural and mechanical layout but also in terms of speed of construction. The company designed the 41,000 m2 of slabs through its own design company, CCL Engineering. With over 100 engineers at its disposal, even large and complex projects can be delivered within short time frames. The flexibility of post-tensioning provided a solution to the mechanical and electrical fit-out difficulties encountered, whilst still achieving the robust structural design constraints required from the project. Speed of design was matched by speed of construction, where the benefits of post-tensioning, in terms of reduced material requirements and the ability to redeploy formwork at early stage, where apparent. As the design was provided by CCL Engineering and materials were supplied by CCL’s own manufacturing division based in the UK, communication and co-ordination issues were kept to a minimum. The project was completed in time and on budget, which clearly demonstrated the speed and flexibility of post-tensioning, combined with the benefits of a full design, supply and installation package from the CCL group.